Small cell carcinoma (SmCC) usually involves lungs. Extra-pulmonary primary SmCC comprises nearly 2.5% of all SmCCs. 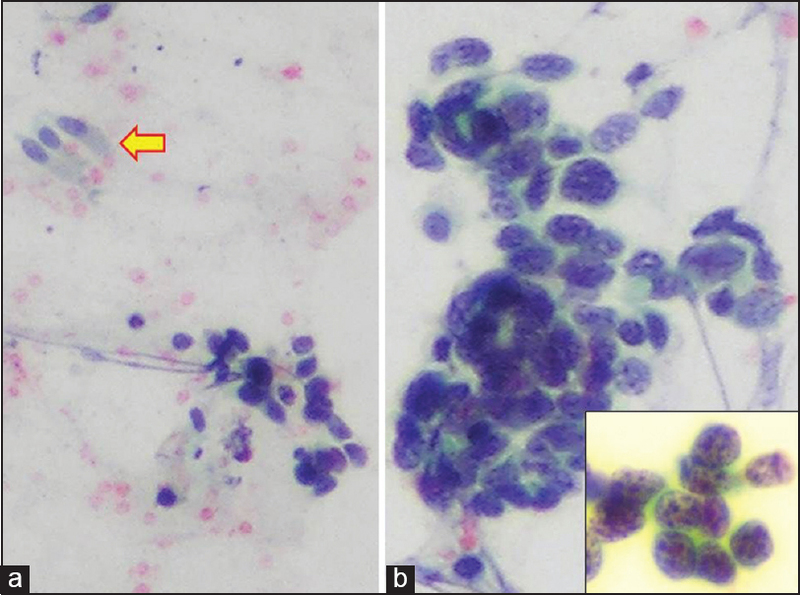 Biliary tract brush cytology is useful in evaluating pancreaticobiliary tract tumors. However, SmCC has never been reported in common bile duct (CBD) brushing smears. A 38-year-old male, smoker, referred to us with history of jaundice/yellowish discoloration since 12 days. His abdominal computed tomogram showed a gall bladder mass, infiltrating the liver and associated with tumor thrombus. His serum bilirubin level was raised (13.98 mg/dL. Reference range = 0.3-1.2 mg/dL); serum globulin level was raised (4.6 g/dL. Reference range = 1.7-3.5 g/dL); alkaline phosphatase level was raised (756 U/L. Reference range = 30-120 U/L); aspartate transaminase level was raised (405 U/L. Reference range = 10-37 U/L) and alanine transaminase level was raised (304 U/L. Reference range = 10-37 U/L). His serum albumin level was low (2.6 g/dL. Reference range = 3.5-5.2 g/dL). His carcino-embryogenic antigen level was raised (5.46 ng/mL. Reference range = 0.3-2.7 ng/mL). His celomic antigen (CA) 19.9 level was also raised (224.68 U/mL. Reference range = 0-37 U/mL). Common bile duct bushing smears revealed benign glandular cells, admixed with groups of small, round to oval cells containing scanty cytoplasm and displaying nuclear molding, hyperchromatic nuclei with granular stippled "salt and pepper" nuclear chromatin and focal streak artifact [Figure 1]. Diagnosis of SmCC was offered. Histopathology of the gall bladder biopsy revealed malignant round cells with hyperchromatic nuclei, within tumor necrosis. On immunohistochemical (IHC) staining, tumor cells were diffusely positive for synaptophysin, chromogranin and (CD56/neural cell adhesion molecule) [Figure 2]. Diagnosis of SmCC was confirmed. Unfortunately, the patient died within 2 months of presentation, just after stenting was performed. Among extra-pulmonary sites, SmCCs rarely occur in the biliary tract. ,, Cytopathological examination of CBD smears is commonly performed in patients undergoing endoscopic retrograde cholangio-pancreatography. In an earlier reported series, only a single case, reported as "intermediate for malignancy" on CBD brushings smears, turned out to be carcinoma of the duodenum containing neuroendocrine and nonneuroendocrine components. Reasons for rarity of poorly differentiated neuroendocrine carcinomas/SmCCs in CBD brushing smears include rarity of such tumors in the pancreaticobiliary tract, compounded with a lower index of suspicion for diagnosis of this tumor at these sites. The differentiated diagnoses in such cases are poorly differentiated adenocarcinoma and non-Hodgkin's lymphoma (NHL). Poorly differentiated adenocarcinoma cells exhibit prominent nucleoli that were lacking in the present case. Awareness of spectrum of cytomorphological features of neuroendocrine tumors, especially nuclear chromatin pattern is useful for diagnosis and triage in such cases. 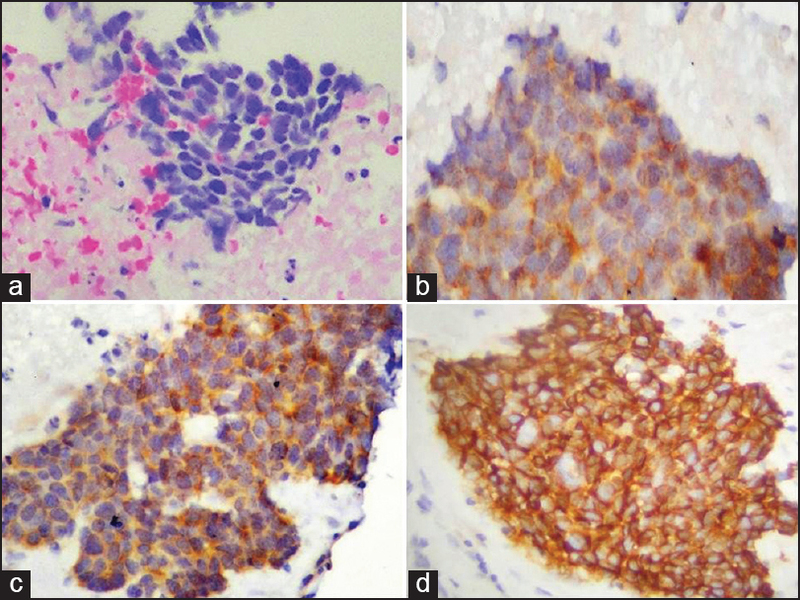 Histopathology, coupled with positive IHC expression of neuroendocrine markers in the present case reinforced the diagnosis. Aforementioned cyto-histopathological features were also helpful in differentiating this tumor from a NHL. To conclude, this forms the first reported cases of SmCC, diagnosed on CBD brushing smears. Careful attention towards "key" cytopathological features, especially nuclear chromatin pattern can be helpful in diagnosing such tumors at rare sites and in various cytology specimens. The support of immunohistochemistry laboratory of our department is acknowledged. Remick SC, Ruckdeschel JC. Extrapulmonary and pulmonary small-cell carcinoma: Tumor biology, therapy, and outcome. Med Pediatr Oncol 1992;20:89-99. Mohammad Alizadeh AH, Mousavi M, Salehi B, Molaei M, Khodadoostan M, Afzali ES, et al. Biliary brush cytology in the assessment of biliary strictures at a tertiary center in Iran. Asian Pac J Cancer Prev 2011;12:2793-6. Nicholson SA, Ryan MR. A review of cytologic findings in neuroendocrine carcinomas including carcinoid tumors with histologic correlation. Cancer 2000;90:148-61. Sun JH, Chao M, Zhang SZ, Zhang GQ, Li B, Wu JJ. Coexistence of small cell neuroendocrine carcinoma and villous adenoma in the ampulla of Vater. World J Gastroenterol 2008;14:4709-12. Park HW, Seo SH, Jang BK, Hwang JY, Park KS, Cho KB, et al. A case of primary small cell carcinoma in the common bile duct. Korean J Gastroenterol 2004;43:260-3.